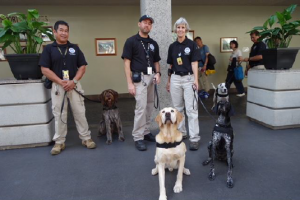 HONOLULU – Officials with the Transportation Security Administration (TSA) Wednesday highlighted its Passenger Screening Canines (PSCs), a key asset used to enhance security and keep passengers safe and secure when departing Daniel K. Inouye International Airport (HNL) in Honolulu. PSCs are trained to detect explosives and explosive materials in a busy transportation environment. They work with a handler searching travelers and their belongings in the security checkpoint and assist with the efficiency and effectiveness of TSA’s screening operations. Passengers departing HNL can at any time expect to see PSC teams working in the security checkpoint. The teams are able to navigate among large groups of people to pinpoint the source of an explosive odor, even if the source is mobile and often without the source being aware it is being tracked. A PSC handler is trained to read its dog’s change of behavior when it indicates an explosive scent has been detected. If a dog alerts its handler to the presence of explosive odor, TSA follows an established procedure to resolve the alarm. 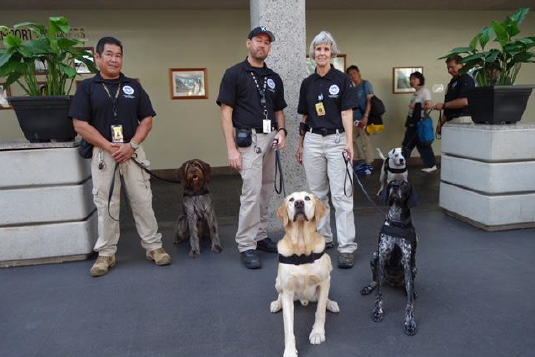 The use of these highly-trained canines is an effective tool in deterring and detecting the introduction of explosive devices into the nation’s transportation systems. Because explosives are known to be the greatest threat to the aviation system, PSCs are regularly tested to ensure they maintain a high standard of operational effectiveness. This continual training allows for all team to be a reliable resource in detecting an explosive threat, maintaining proper acclimation within the airport and mitigating potential distraction in a busy transportation environment. Currently, TSA has more than 320 PSC teams who work primarily at airports across the country. sociable, they are working dog and they should not be petted or fed by anyone except their handlers. for five years and can usually be seen working at Daniel K. Inouye International Airport (HNL). enjoys swimming at the beach, sleeping on the couch and, of course, eating. the TSA canine program since 2008. Duke is a three-year-old German Shorthaired Pointer and loves working with his handler Chuck. yard to play in. He shares it nicely with his roommate Rottweiler D-1. Kajla, aka “Bugs,” is a three-year-old Vizsla handled by Transportation Security Specialist Penny. when other canine teams deploy to support other big events. spotted at the many surf breaks relaxing on the beach, swimming, or surfing.